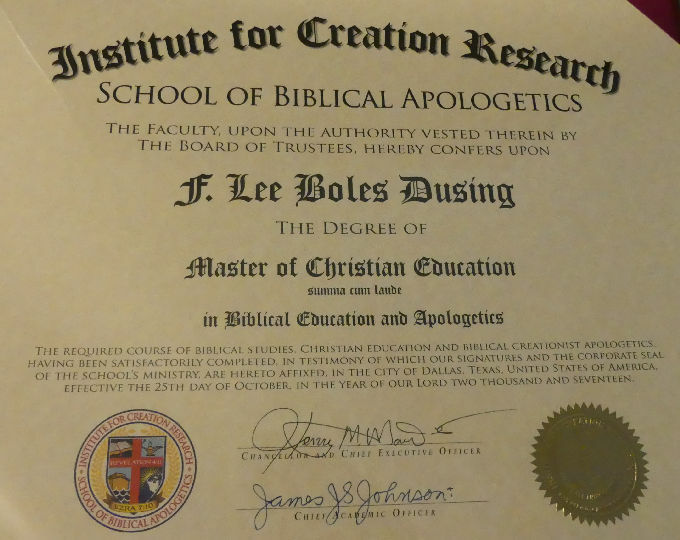 From February 2016 until October 2017 I was working on a Master’s Degree online from the School of Biblical Apologetics. With my back surgery, a hurricane, and etc., etc., … I failed to post the conclusion of it. It’s about time I express my thankfulness to the Institute for Creation Research for having the online school. I praise the Lord for the opportunity to take the great courses offered through the School of Biblical Apologetics. 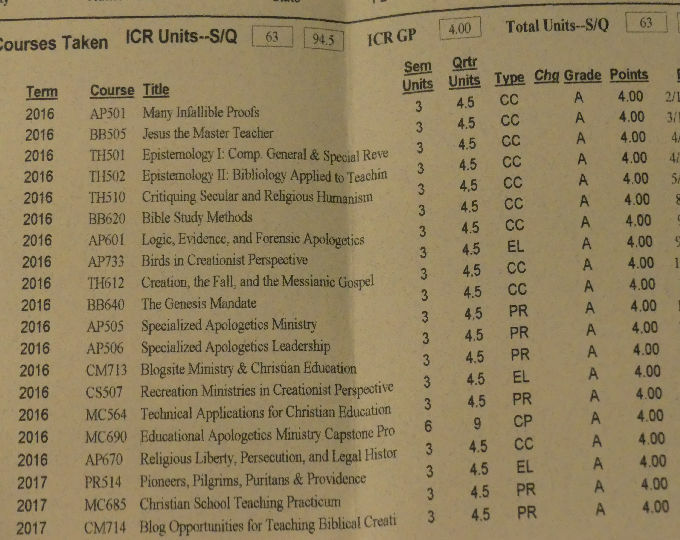 Here is a list of the courses that I took for my Master of Christian Education in Biblical Education and Apologetics. SOBA provides certificate-level, undergraduate-level, and graduate-level training in biblical education and apologetics. SOBA’s foundation is Scripture, which the school and its faculty hold as inerrant, accurate, and authoritative. Biblical creation, with a special emphasis on Genesis 1-11, is a significant focus of all SOBA degrees, majors, and minors. This focus sets ICR’s program apart from other graduate level apologetic programs. Fulfilling the purpose of training future leaders in biblical education and apologetics, while maintaining a strict adherence to Scripture (including biblical creationist appreciation of Genesis 1-11), makes ICR’s School of Biblical Apologetics the best choice for those desiring to round out their biblical education. SOBA prepares its students with defensible answers for their faith, giving them the tools necessary to “be ready always to give an answer” for the hope within (1 Peter 3:15) and to “earnestly contend for the faith” (Jude 1:3). Dr. James J. S. Johnson is the Chief Academic Officer of the School. As you may know, he posts articles here on this blog. He loves birdwatching and taught birding courses previous to joining I.C.R. He was a tremendous encouragement for me to begin and continue working on this degree. Also, Mrs Mary Smith, the Registrar and Academic Coordinator, was a great encourager. My thanks to both of them. My husband, Dan, was my most encouraging supporter. He helped complete my neglected duties because of me “having my head in a book.” :) Thank you, Dan! At my age, this degree was undertaken for several reasons. It was to help increase my Biblical Knowledge and to help me explain the Creation of God’s fantastic critters better. In other words, for personal enrichment and better witnessing of God’s Love and Salvation. The best decision I ever made in my life was on March 20, 1960, when I personally accepted the Lord Jesus Christ as my Personal Savior. I desire to use the truth of God’s Word to encourage others to, 1) accept Christ as their personal Savior, 2) to read and study the truths found in Scripture, 3) apply the Word to their lives and grow Spiritually, and 4) use that knowledge to teach others to do the same. Please check out the School of Biblical Apologetics and see how you could also benefit from their courses. This entry was posted in Birds, Birdwatching, Christian, Export to Leesbird, Good News, Orni-theology and tagged Apologetics, Christianity, Creation, Dr. James J. S. Johnson, Institute for Creation Research, Masters Degree, School of Biblical Apologetics, Thankfulness. Bookmark the permalink. Congratulations (again), Lee! Either you are the hardest-working online student that ICR has ever had, or else you are tied with whomever else qualifies for that title! It has always been a privilege and a pleasure to be involved with your Christ-honoring work at LEESBIRD.COM and via ICR, especially when it involves birds and blogging, at which both of which you excel! Thanks for honoring God with your talents, your time, your tireless tenacity, and your tremendous service for our Lord Jesus Christ. Thank you, Dr. Jim. I am honored to have had the priviledge to complete the very fine and Christ-honoring courses offered by the School. I trust that the Lord will let me apply even some of that towards presenting Him through this blog and elsewhere. It is HIS birds that I enjoy presenting to others. Thank you for your contributions to Leesbird.com. Your aticles greatly enrich the postings. Congratulations! 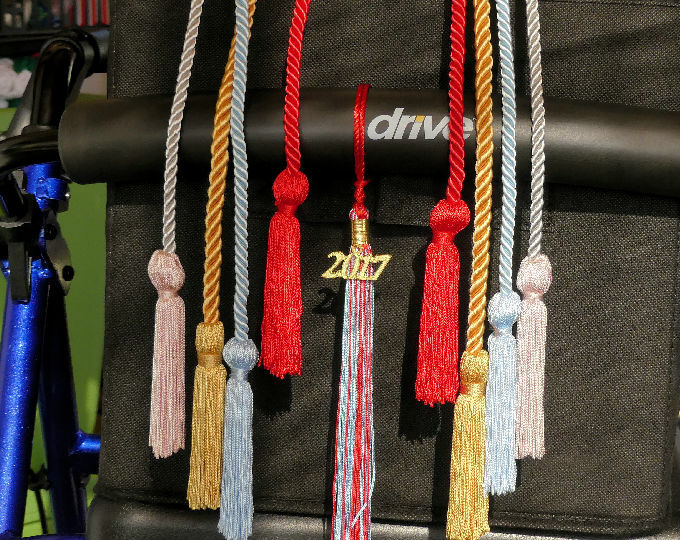 Hanging the tassels is a great way to create a conversational opening, too. Thanks, Ashley! Never too late to keep learning. A BIG TEXAS CONGRATULATIONS to you Lee. You did have a number of Goliath’s in your way but you overcame them all – back surgery, a scary hurricane, and etc., etc. I love the walker with your tassels – you are very creative so it is no wonder you finished so well and so fast in spite of much going on in your daily life. I know you will find many unusual ways to honor the Lord with your degree and credentials. Watch out world! Thanks, Sherry! I didn’t know how else to show it off without being too boastful. Was almost embarrassed to write this blog. I am more proud of SOBA and what they teach than what I accomplished. Does this mean you are a young earth Creationist? Interesting. So the earth is only about 6000yrs old? If you believe the Word of God, it is not “old.” The exact instant it was created in time is not known, but it is definitely not billions of years old. How is that school accredited? So they are not accredited at all? Wasnt there a lawsuit a few years ago? congratulations. I liked the walker comment. Very funny. YAY!!! And Straight A’s too, I see. Beaucoup congratulations! Thanks. Much better than my high school grades. Or my Bachelor’s. The Lord makes all the difference. There are many who discard the Bible as true, and only want to accept the parts that suit their fancy. God said He created the world and all that is in during the first 6 days of creation. He has always been, and chose to create time and space. We can’t see God, but we can see the world, fallen as it is, that He made. We can observe the details and thoughts and knowledge that went into his critters, especially the birds, and see such wisdom, etc. Man says all this evolved out of nothing other than a “big bang” or whatever method they want to use. He goes to school, “accredited” ones, and believes it “hook line and sinker.” The “world” and the truth of God’s Word do not always match. In fact, most time they throw out anything that has to do with God and The Truth. Yes, the school is not accredited, but they are teaching Biblical Truths in a Christian Education setting, not a science school. By the way, Berkley University in California is “accredited.” I wouldn’t send a dog there to take any of their courses. They have totally thrown out any morality and want nothing to do with God. They are totally corrupt. Take your choice.